(Bloomberg) -- When Saudi Arabia unveiled the $69 billion Aramco-Sabic deal on Wednesday, officials described it as a "win-win-win" that would bring rewards for the government, the giant oil company and the chemicals group. The reality is likely to prove more prosaic. The deal is a Plan B to raise money for the country’s economic agenda after the initial public offering of Aramco, slated for 2018, was postponed. In effect, Crown Prince Mohammed bin Salman is using the company’s pristine balance sheet to finance his ambitions. The deal between three government-owned entities -- where the kingdom’s sovereign wealth fund sells its 70 percent stake in Sabic to Aramco -- moves money from one pocket of the state to another. For Prince Mohammed and the country’s Public Investment Fund, the deal is a clear win. It provides much needed cash for their global ambitions, which include buying stakes in Tesla Inc. and Uber Technologies Inc., and building a futuristic city in a remote corner of the Saudi desert. For Aramco, however, the deal is less obviously positive. The upsides include diversification into plastics, which could be a hedge against slowing growth for transport fuel as the world switches to electric vehicles. But it also moves the company into a lower-margin business and means taking on debt, while the structure of the transaction limits synergies significantly. “This transaction is a major step in accelerating Saudi Aramco’s transformative downstream growth strategy of integrated refining and petrochemicals," Amin Nasser, chief executive officer of Aramco, said when the deal was announced on Wednesday. 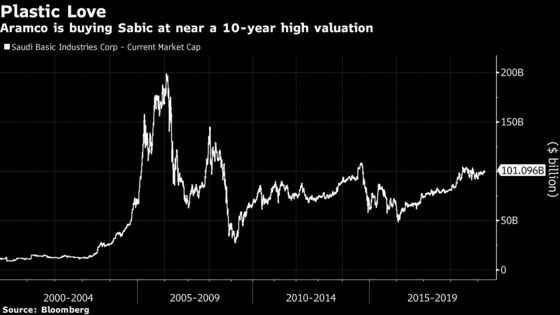 Aramco isn’t paying a premium for Saudi Basic Industries Corp., but it’s buying at close to a 10-year high, valuing the whole company at roughly $100 billion. In 2016, Aramco could have bought Sabic for just $50 billion. The deal isn’t cheap compared with rivals: Germany’s BASF SE, the world’s largest chemical producer, is worth less than $70 billion. Aramco officials tried to negotiate a lower price, but the PIF resisted, according to people directly involved in the talks. The biggest winner in the deal is the sovereign wealth fund. Under the leadership of Yasir Othman Al-Rumayyan, a close lieutenant of Prince Mohammed, the fund is shifting its focus from illiquid domestic investments like Sabic into international private-equity-like deals. The stake in Sabic offered the PIF few options. It was unlikely it could ever sell the shares in the Saudi stock exchange, or flip the company to an overseas competitor. Worse, it was earning a paltry return on its money, with Sabic paying a dividend yield of 3.5 percent based on current share prices. That’s well below the 5 percent that BASF pays, or the more than 6 percent that Royal Dutch Shell Plc distributes. For Aramco, the advantages of the deal, including moving its center of gravity a bit away from oil into plastics, come with significant costs. Until just before the transaction was first mooted a year ago, Aramco executives tended to looks down on their petrochemicals cousin, considering it less well managed and over-staffed, according to people familiar with the company’s view at the time. Sabic employs 35,000 people, compared to 70,000 for Aramco, which produces 10 percent of the world’s oil. The priority of Aramco in the petrochemical sector had been to invest in so-called specialty chemicals where margins are large. Sabic is more involved in commodity chemicals such as ethylene and polyethylene, where competition is fierce and margins are razor thin. In that quest, Aramco partnered with Dow Chemical Co. to build a $20 billion petrochemical complex called Sadara in Saudi Arabia, and invested in a joint-venture with German group Lanxess AG. It also explored using its U.S. refining subsidiary Motiva Enterprises LLC to invest in petrochemicals, taking advantage advantage of cheap feedstock from the shale boom. Aramco changed course after its IPO was postponed and Prince Mohammed pushed for another way to raise cash. The focus on specialty chemicals was abandoned and Aramco switched attention to Sabic. The final catch in the deal arises from the Saudi stock exchange, called the Tadawul. As one of the kingdom’s largest listed companies, Sabic accounts for nearly 10 percent of the benchmark index and de-listing the chemical producer wasn’t an option. So instead of a complete takeover, Aramco is buying just the 70 percent owned by PIF, leaving another 30 percent floating on the market. That will deprive Aramco of the cost savings that typically come from mergers as Sabic remains a stand-alone company with separate corporate functions. For Aramco, the biggest advantage is to push deeper into the world of plastics, which executives and analysts believe will be more resilient to any slowdown in demand than oil-based fuels. And the deal will lead to at least some cost savings, said Steve Zinger, a chemicals expert at consultant Wood Mackenzie Ltd.
"The acquisition of Sabic can allow wider collaboration and avoid competition, as the two companies more recently have been overlapping," Zinger said.